When the the fourth series of Being Human began I asked Can Being Human survive without Mitchell, Nina and George? The answer turned out to be yes, but not for long. SPOILER ALERT- CONTAINS HEAVY SPOILERS OF “THE LAST BROADCAST”. SERIOUSLY, DON’T READ ANYMORE IF YOU HAVEN’T WATCHED IT YET! As the fifth series began to air in February, the BBC announced that it would be the last. The departures of the original cast caused inevitable anxiety among fans. 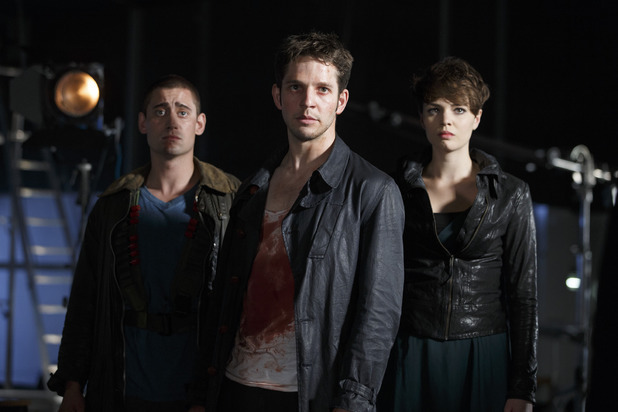 But during the fourth series, new vampire and werewolf Hal and Tom settled in well at Honolulu Heights, and were joined by new ghost Alex in time to take over from Annie. Her exit to eternal bliss involved blowing up baby Eve to save the world. That was a daring plot choice, and one that a less brave show might have shied away from and found a loop hole for. Now, the final episode “The Last Broadcast” has aired and the series is over. And I have to say I think the final episode was one of its finest. Joss Whedon: No more heroes anymore? Buffy re-watch: Is Nightmares Buffy’s Wizard of Oz?